Summer Vegan Pasta Salad with a velvety avocado dressing is light and refreshing. Loaded with fresh vegetables and enhanced with sunflower seeds, this salad will amaze your taste buds. It is perfect when you crave for a tasty and easy vegan cold pasta salad for lunch. Everything in this vegan pasta salad screams summertime. Just like our Turkish Spicy Ezme Salad, which can be considered as a kind of salsa, this recipe calls for summer vegetables. Cucumber and fresh dill are my obsessions during the season and I add them in salads like this. I also use cherry tomatoes and red bell pepper for their fresh flavors and the lovely color. You know my love of avocado, right? I use it both in the dressing and in the salad to double its amazing flavor. In addition, I added some sunflower seeds to give my salad a subtle nutty flavor and a little crunchiness. The recipe is very easy to follow. I use my favorite Avocado Dressing in this salad. Did I tell you before that I can pour it over anything? If you make it ahead and already have the leftover dressing in the fridge, that’s great. 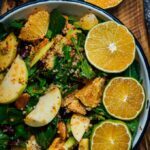 Don’t worry if this will be your first time to make this amazing dressing which is vegan as well. You need only 5 ingredients and 5 minutes for it. Make your dressing first and put it aside. Cook your choice of pasta according to package instructions and let it cool while you prepare the other ingredients. You can even run the pasta under cold water so that it cools faster. Chop cucumbers, red bell pepper, fresh dill, onion and avocado finely. Put them all in a large bowl. Add in the cooked and cooled pasta. Sprinkle sunflower seeds and salt. Pour the avocado dressing over it and stir until fully combined and everything in the bowl is well coated with the dressing. Garnish with cherry tomato slices. This vegan summer vegan pasta salad recipe is so versatile. You can adjust it to your taste. Besides the vegetables above, peas, green beans, asparagus or corn work fine in vegan salad recipes like this if you have these on hand. Make sure you blanch the green beans and peas beforehand. Oh and jalapeno would be wonderful too if you’d like to give your salad a hot touch. If you aren’t a fan of avocado (not sure whether such a person exists), check out our Vegan Potato Salad with Tahini Dressing and use the dressing in that recipe for this salad. This vegan pasta salad with avocado dressing is perfect for summer get-togethers. As it is dairy-free, it’s safe to take it out. Believe it or not, it disappears fast and nobody realizes it’s vegan. Oh and if you make this Vegan Pasta Salad, I’d love to hear your feedback. Please rate the recipe and leave a comment below. You make my day if you take a cell phone picture and share it with me on Instagram. Just tag me @zerrin_giverecipe and I don’t miss it. You have no idea how happy I get when I see someone making my recipes. Light and refreshing vegan pasta salad that you can enjoy during summer. Cook the pasta according to package instructions. Set aside to cool or run it under cold water so that it cools faster. In a large bowl, mix together the cucumber, fresh dill, red bell pepper, avocado and onion. Add in the cooked and cooled pasta. Sprinkle sunflower seeds and salt. Pour the avocado dressing over it and stir until fully combined and everything in the bowl is well coated with the dressing. Garnish with cherry tomato slices. If you’d like your pasta salad more creamy, you can add more avocado dressing. 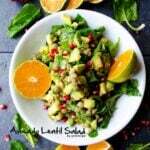 Indeed a perfect salad recipe for summer! Thank you Lori! Everyone loves it whenever I make it.